Long sales cycles. Complex purchasing decisions. A laser-focus on ROI. On its head, B2B social media strategy seems much more serious — and far less frivolous — than its consumer-oriented marketing cousin. But as traditional B2B marketing went digital, a latency around social media remained. We couldn’t help but wonder… why? Many industry-defining B2B brands have not only embraced social, but have completely changed the game with innovative social strategies. So we set out to determine how B2B industry leaders drive value for their brands on social media, and pinpoint what the rest of the pack can learn from them. To get at these questions, we used the TrackMaven digital analytics platform to analyze 12 months of social media content from 316 leading B2B brands across five key social networks: Facebook, Twitter, LinkedIn, Instagram, and Pinterest. Overall, our analysis included a grand total of 508,060 social media posts and over 100 million social interactions. The 316 brands featured in our analysis include the leading B2B brands in the Global 500 and B2B leaders on social media as identified by the TrackMaven platform across 17 industries. In short, the findings in our report, the 2016 Social Media Impact Report: B2B Industry Edition, point to what works (and what doesn’t) for the best B2B brands in your industry. Which B2B brands outperform the rest of the pack? And which social networks really drive results for brands in each sector? Let’s take a look. 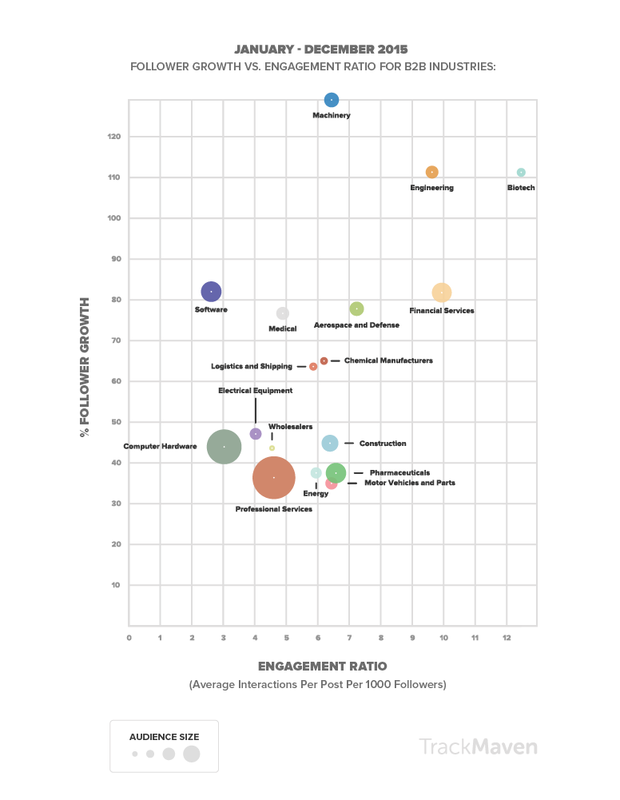 Which industry has the best B2B social media strategy? Want to discover more opportunities for your B2B brand to stand out on social? Download the complete report on B2B social media strategy to learn which social networks drive the greatest impact for your peers, and see how your brand measures up against industry-specific benchmarks.